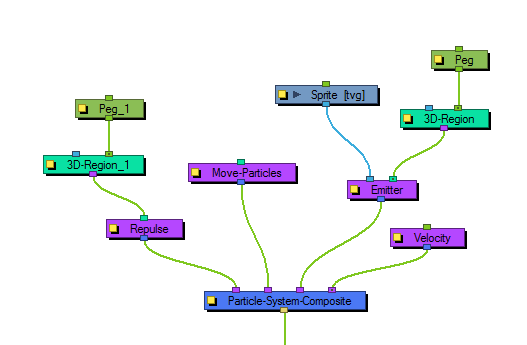 This module will repulse a particle around a region, but different from bounce, it's repelled before it physically hits the region. 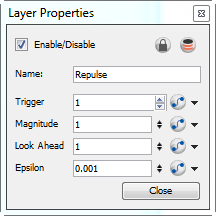 Use the Repulse Module's Layer Properties panel to adjust the effect's parameters. • Magnitude: This value should be between 0 and 2. The higher the value, the more drastically the particles will be repulsed. • Look Ahead: This value alters how far ahead of the particle's current position it will look to see whether there's an obstacle coming ahead. This value should be between 0 and 100. • Epsilon: This value affects how quickly the effect of the repulse wears off. The smaller the number, the longer the effect lasts. This value should be between 0.1 and 0.0001.